*1. 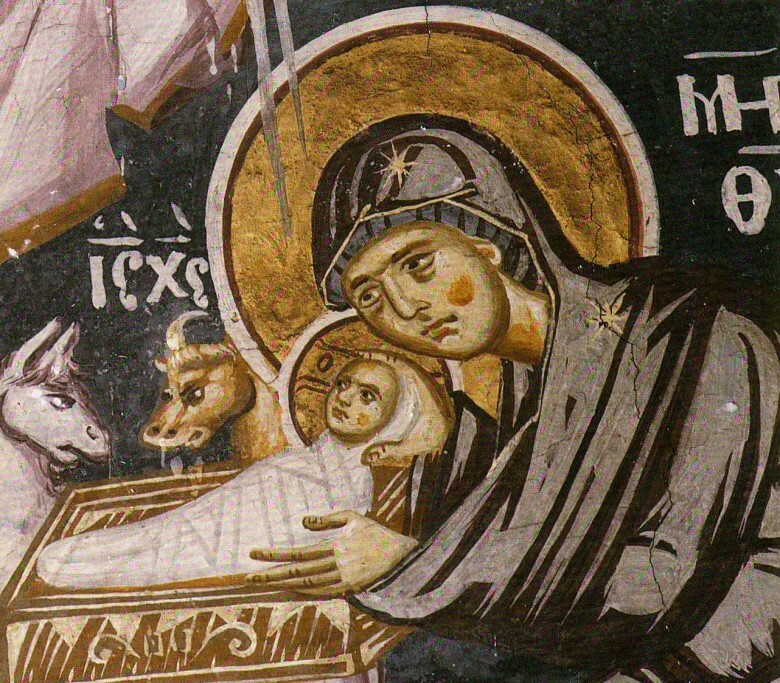 The Mystery of the Incarnation. God who is All-Powerful could have liberated the human race from the hands of the Devil by a single command. Had he done that, however, we would have known only his All-Powerfulness, which we already knew. We would not have known his Compassion and Love in spite of the fact that we are hostile to him. *2. Why Did the Incarnation Take Place at That Time? No one should examine why the Incarnation took place then, and not earlier or later, because only he knows it. He was incarnated “from the Holy Spirit and the Virgin Mary” because there was never before, nor will there appear again, such a Virgin in the human race as immaculate as the Virgin Mary, sanctified in the flesh and worthy to be united with the Godhead of the Son of God, the Son of God who assumed the entire man from her pure and immaculate blood. *3. This Mystery of the Incarnation is inconceivable according to the prophet Jeremiah who says: “And he is a man, and who shall know Him?” (Jer. 17:9). The great Paul also declares the same: “And without doubt the Mystery of our piety is Great: God appeared in the flesh” (1 Tim. 3:16). Through communion with the Godhead the entire man was deified “in Christ.” The humanity of Christ enjoyed all the charismas and benefits of the Godhead, since Christ is perfect God and perfect man after the union. This is similar to the initial light, which God created and which fell on the sun’s disk and the entire disk became full of dazzling light. *4. The Godhead deified the Human Nature, which is now deified together with its soul, which is endowed with mind, reason, will and energy. As a man, Christ was exposed to the so-called natural but blameless passions. In others words, he felt pain, thirst, weariness, even faintheartedness in a natural way. He did not display, however, any blameworthy passions, i.e. those deriving from evil choice. This was the case because he was united with God, who was the leader of his rational soul and preserved Christ sinless. *5. The Manner of the Incarnation. Saint Maximus says that the Angels knew the impending Incarnation of the Son of God for the salvation of human beings. What however, escaped their perception were the unthinkable Conception and the manner of the Incarnation. How he could be entirely in the Father and entirely inside all things which he fulfilled, and also entirely inside the belly of the Virgin! *6. The Name “Jesus” and the Greek Alphabet. The Name Jesus, which is “the Name above every other name” (Phil. 2:9), means Savior for the Jews and healer (iomenos) for the Greeks. And indeed, Christ is the Healer of our souls and of the bodies of those who believe in him. The curious point here, however, is that this great and divine Name was indicated before hand through the Greek Alphabet, which consists of 24 letters! *A) Josephus. The Jewish historian Josephus says this about Christ: “Now there was about this time Jesus, a wise man, if it be lawful to call him a man, for he was a doer of wonderful works –a teacher of such men as receive the truth with pleasure. He drew over to him both many of the Jews, and many of the Gentiles. He was the Christ; and when Pilate, at the suggestion of the principal men amongst us, had condemned him to the cross, those that loved him at the first did not forsake him, for he appeared to them alive again the third day, as the divine prophets had foretold these and other wonderful mysteries concerning him; and the tribe of the Christians, so named from him are not extinct at this day” (Antiquitates Judaicae, Book 18,64.2). In other words, Josephus wonders whether Jesus was only a man, since he did so many incredible things and taught in such a way that he made many Jews and Greeks believe in him. Also, when the leaders of the Jews delivered him to Pilate to be crucified, his disciples did not reject him, for he was resurrected on the third day and appeared to them according to the predictions of the prophets who had spoken about this and many more mysteries concerning his person. Indeed his followers took his name and came to be called Christians and their race has not ceased to exist to this day. *B) The Roman Emperor Augustus. Eusebius of Pamphilos (Metropolitan of Caesarea in Palestine) reports that the Roman Caesar Augustus went to the Oracle of Delphi and offered sacrifice there as a Greek in order to ask Pythia who gave the oracles to tell him who would reign after him. Pythia gave him the following oracle: “A Hebrew child, who will reign over the blessed gods, orders me to leave this altar and return to Hades again. Depart, therefore, silent from my altars” (Oracula, or Suda, Lexicon alpha). When Caesar Augustus heard these things, he returned to Rome and erected an altar on which he inscribed: “An Altar to the firstborn God” (Johannes Malalas, Chronographia or Suda, Lexicon, alpha). It is truly amazing to think that the demon was forced by the divine power to witness to the Gentiles the divine birth of Christ the God-man! *C) Porphyry. The opponent of the Christians Porphyry says the following: “But now [the Gentiles] marvel how the disease has befallen the city for so many years and there has been no intervention either from Asclepius (the god of health) or from any other gods. Because the honor offered to Jesus did not leave room for any common help from the gods” (Porphyrius, Contra Christianos 80.3, or Eusebius, Preparatio Evangelica V.1.10). *D) Orpheus. Orpheus says: “Voice, I attest you, of the Father, which he uttered first. When he established the world on his own will” (Justin Martyr, Cohortatio ad Gentiles, 16). And the next verse says: “and when you look at the divine word, attach yourself to him” (Ibid. De Monarchia, and Clement Alexandrinus Protrepticus and Stromata). *8. God Became Man in order to Conquer the Devil as Man. Since he was born in an ineffable manner, and received the homage of the Magi, and that unusual star appeared in the sky, and he was fed with human milk, and grew up, and went to the desert and fasted for forty days, the Devil thought that he was only a man and could fall if tempted with hunger and so he started tempting him hard. But Christ rebutted the enemy, putting forth the light of Scripture, not using the power and authority of his Godhead, but following the natural sequence of humanity. It was as a man, then, and not as God that Christ conquered the Devil, because the Devil had conquered the first man at the beginning not as God but as man. It was necessary, then, that the Devil should be conquered by man. This is why the divine Dionysius the Areopagite and Gregory the Theologian say, that “Christ conquered the Devil not by power but by right judgment and righteousness” (Dionysius, De ecclesiasticae Hierarchia). Luke the Evangelist says that Christ sustained all temptations, because he scored victories over the three capital ones, gluttony, vainglory and avarice, which give birth to all others. Thus He put the Devil to shame. *9. The Public Ministry of the God-Man and its Conclusion in the Resurrection. When Christ came down from the desert and gathered together his disciples, he preached to the world for three years and produced many miracles, having first completed the thirtieth year of his age. After all these things his disciple Judas sold him by treachery, and Christ accepted it, because he wanted to redeem us, human beings, who had been sold to the Devil through sin. He deliberately handed Himself over to those who pursued him, because he wanted to complete the divine economy and redeem the human race. He was crucified, died and buried, and the Third Day he rose and appeared to his disciples and to the women. Then, forty days later he blessed his disciples, and having taught them about peace, he ascended into heaven and sat at the right hand of the Father having fulfilled all things and having deified man. *10. Epilogue From the Words of Dionysius the Areopagite. We shall let Dionysius the Areopagite to close this chapter. And first of all we shall recall what he says about the darkness, which occurred when Christ was crucified. There is, he says, the witness of the Greek astronomer Phlegon who said: “In the second year of the 202nd Olympiad a major eclipse of the Sun occurred, the like of which had not been seen earlier,” so that the stars appeared in the sky” (Johannes Malalas, Chronographia). This is one additional witness of the Greeks, which is connected with the Crucifixion of our Lord Jesus Christ. Bishop Theophilos of Campania (1749-1795) was one of the brightest figures of the Church in the 18th century; distinguished for his theological and canonical expertise. He was born in Ioannina and became a Bishop in Campania, the area to the west of Thessaloniki and opposite Chalkidiki. He was probably a student of the famous teacher Eugenios Voulgaris and is particularly known for his book Tameion Orthodoxias (Treasury of Orthodoxy), which run through eight editions from 1780 to 1939. Tagged with: Bishop Theophilos of Campania Bishop Theophilos of Campania on the Incarnation of the Son of Man Christ Dionysios the Areopagite Fr George Dragas God God became Man in order to conquer the Devil as Man God deified human nature Holy Spirit Human Nature Incarnation John Malalas Mary Meaning of the name Jesus Meaning of the name Joshua Mystery of the Incarnation Orpheus Peace on earth and good will among men Porphyry the Philosopher Public ministry of the God-Man Son of God St Clement of Alexandria The Manner of the Incarnation The name above every other name The Resurrection of Christ Virgin Why did the Incarnation take place at that time? 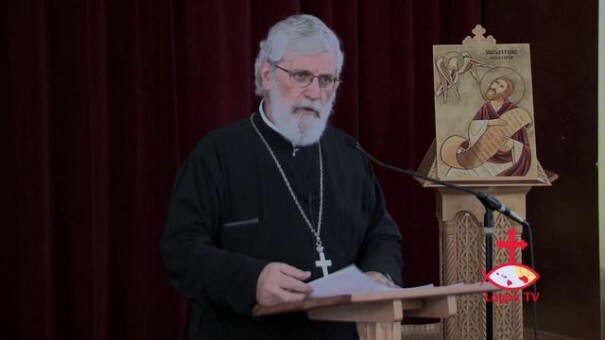 Previous: Metropolitan Anthony of Sourozh: Begin the New Year with courage!